Occupying an area of less than 95 square kilometers, the small island of Panglao in Bohol is a magnet for travelers and adventurers. Particularly, scuba divers from all around the globe travel to Panglao to explore its diverse dive sites. 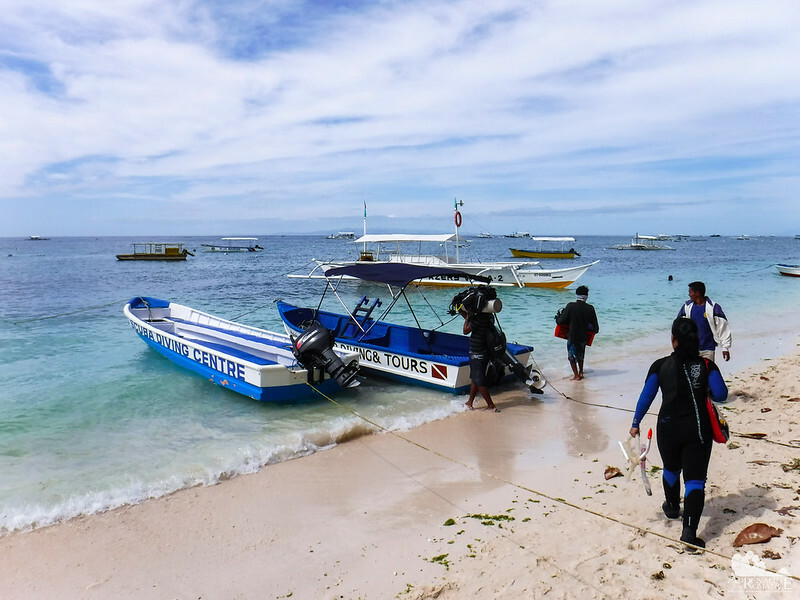 In fact, marine life in Panglao’s underwater kingdom is so rich that the Panglao Marine Biodiversity Project found out that the island alone has more biodiversity than the Mediterranean Sea and Japan combined! We, Filipinos, are very lucky to have such a natural treasure in our midst. 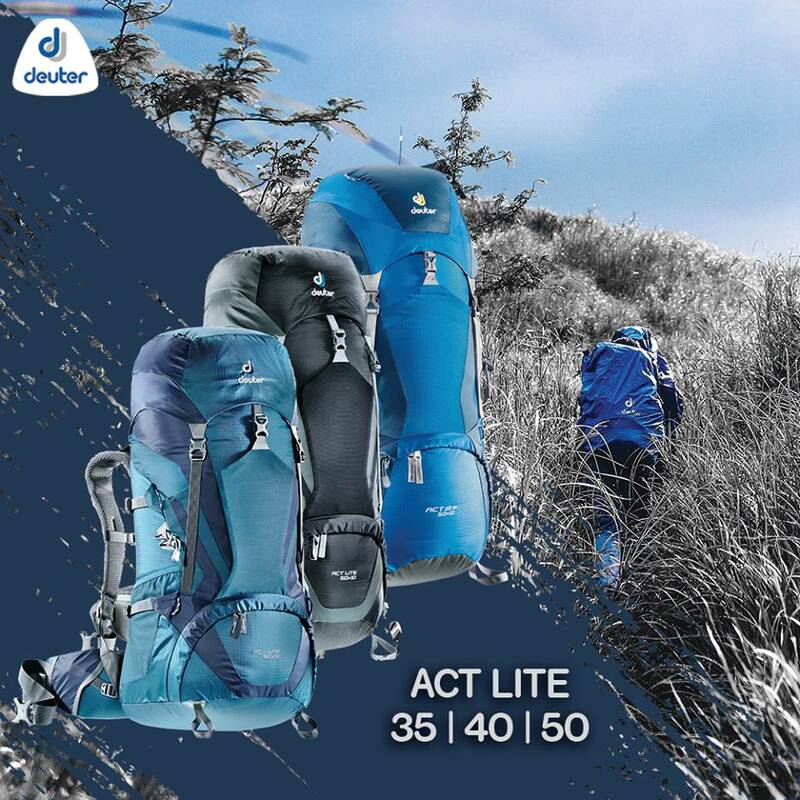 Why not explore and enjoy them? That’s exactly what we did thanks to GoDeep Philippines, a Panglao-based scuba diving outfitter, and Bluewater Panglao Beach Resort. At exactly 8 AM, a private green multi-cab from GoDeep Philippines fetched us from the resort, signalling the beginning of our day’s adventure. 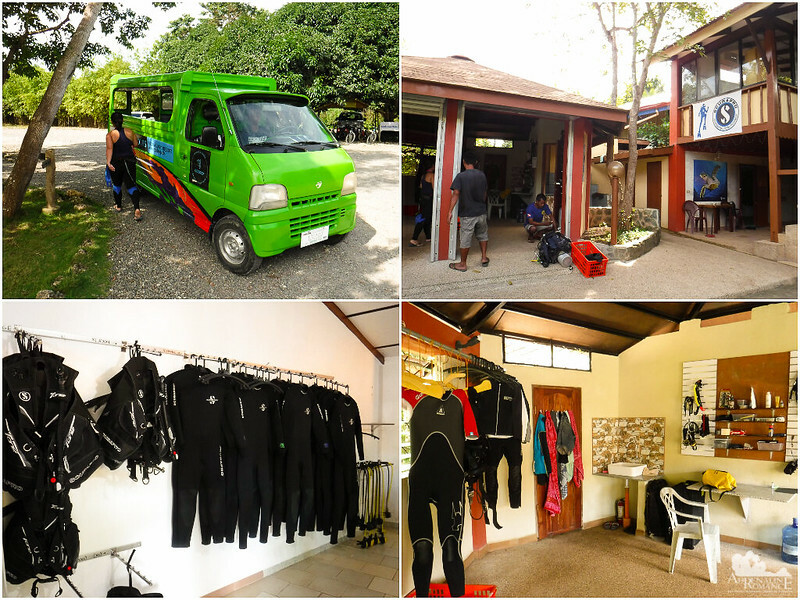 We headed to their well-equipped dive shop where we were outfitted with scuba gear and met our friendly divemaster JI. Unfortunately, we weren’t able to meet with the owner because he was guiding some tourists in nearby Balicasag Island. After all the preparations, we headed to our jump-off point at sandy Alona Beach. This stretch of white sand is one of Panglao’s treasures, drawing local and foreign tourists all over the world. Shops, restaurants, and accommodations of all classes are located here. JI and his team loaded all our equipment into—a speedboat? Oh, yes! It was our first time riding a real speedboat, and we were childlike giddy with excitement. And the best thing of all? When we mentioned this to our boatman, he decided to give us a taste of real speed! He opened the boat’s throttle almost to full power. Yes, he wants to satisfy our need for speed! We jumped and skipped on the waves as the salty sea breeze transformed into a sharp blizzard that stung our face. We were delightfully screaming and cheering with each wave bump! 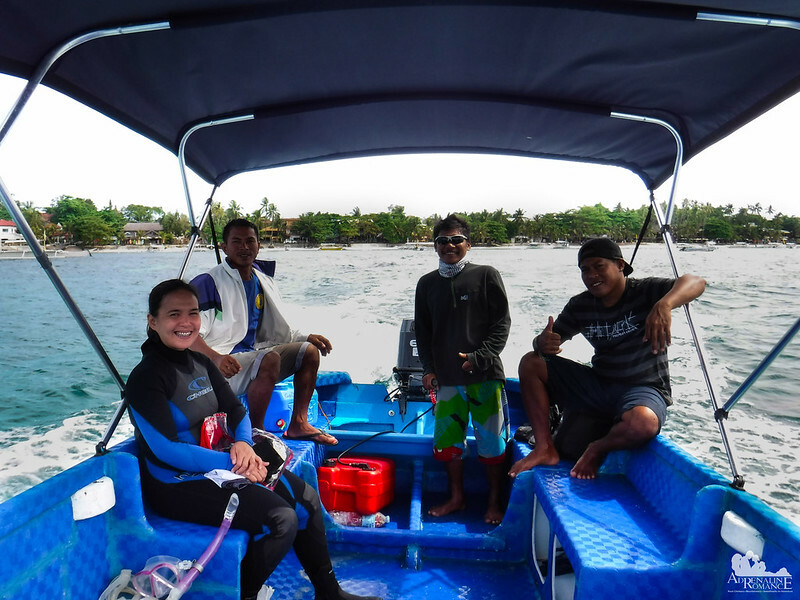 Before heading to the dive site, we stopped by one of GoDeep Philippine’s large dive boats, which was anchored near the shore of Bluewater Panglao, to drop off a crew member and a few tools. A large boat such as this can cater 20 to 25 fully-equipped divers along with spare air cylinders, a feast, and more. 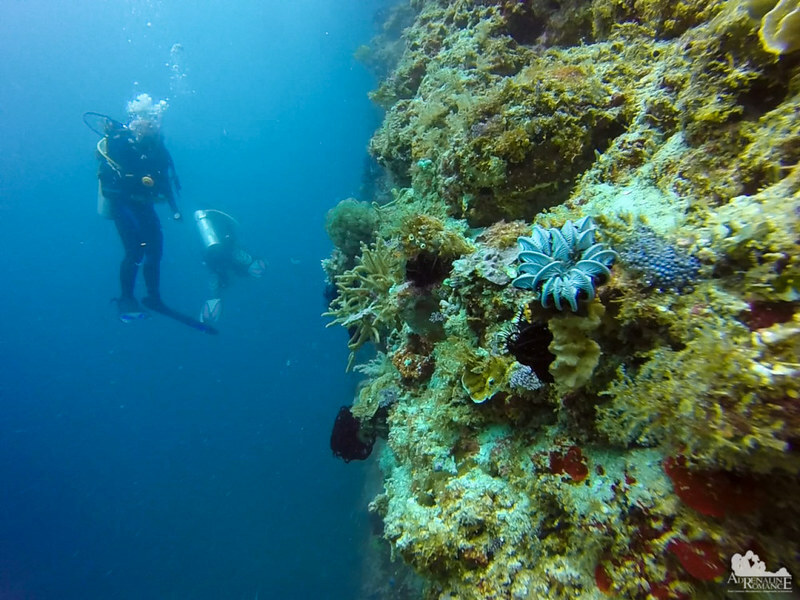 We raced to our dive site in Arco Point, which was just a few hundred yards from the old Bohol Beach Club resort. After a short pre-dive briefing, we suited up, executed pre-dive checks, and entered the water via back entry. Almost immediately, a school of fish having a “class” near an anemone that can actually eat them (except for that clownfish) greeted us. Patches of rocks, sea grass, and corals dotted the sandy slope, making the entry seem plain and ordinary. But we were in for a surprise. After a minute or so, we saw an ominous dark something in the distance. What could it be? As we approached the coral-encrusted edge of the kantil, we suddenly realized that it was a deep, dark blue hole. It was the gateway to Arco Point as JI pointed during our briefing! As JI entered the hole first, we felt an unfamiliar knot of excitement and trepidation in our tummies. As much as this blue kingdom belongs to our planet, the mysterious realm under the sea is incredibly alien and dangerous. Going through that hole makes it seem that we were entering the point of no return. One by one, we went through the small cavern, which was actually big enough to enter without us touching the roof, floor, and edges. 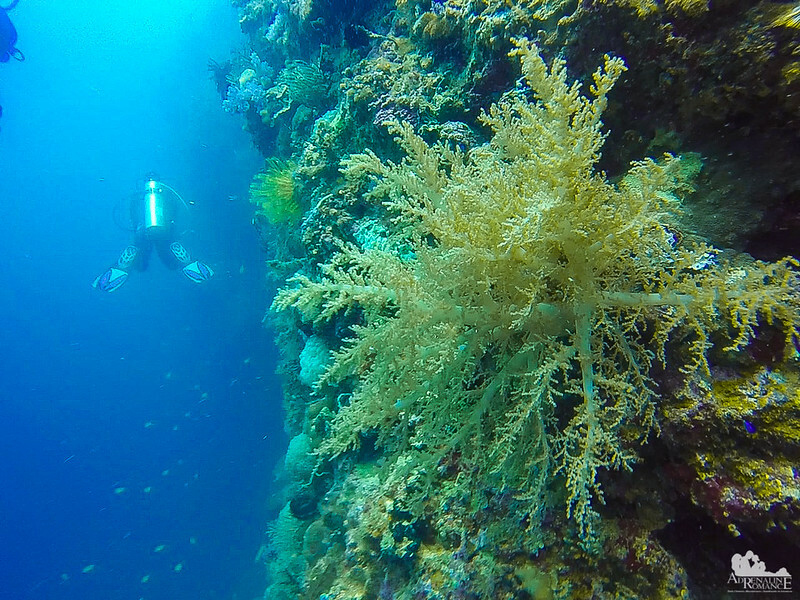 Still, we had to be mindful of our buoyancy because the entire cavern is lined with sponges, corals, and crinoids. A careless bump would irreparably damage these biological wonders. We had an incredibly euphoric feeling as we exited the hole. Right before our eyes is the vast blue of the open sea, which harbors treasures and mysteries beyond our understanding. On either side of the exit is a rocky wall that is encrusted with all manner of marine life. Hmmm…a group of divers seem to be quite interested in something in the wall. Let’s see what they’re up to. Indeed, they (and us) were lucky to have found a rarely seen marine animal. That’s a carefully camouflaged frogfish resting in a the cavity of a sponge, keeping a baleful eye on us who are curiously checking it out. Frogfish are masters of camouflage. It uses camouflage and mimicry to avoid predators and to hunt prey. This big one perfectly imitated the color and texture of the sponge. After waving goodbye to the other team of divers, we continued our way south. 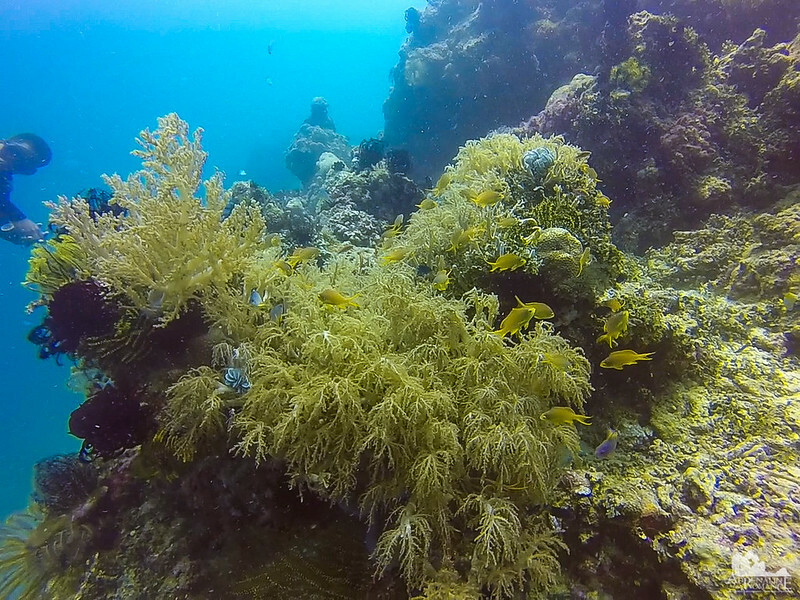 One of the most beautiful and unusual features of Arco Point’s wall is the massive abundance of these lovely periwinkle soft corals. The soft and dainty Nephtheidae look like blossoms underwater, forming one of the major decorations of this vast underwater garden. 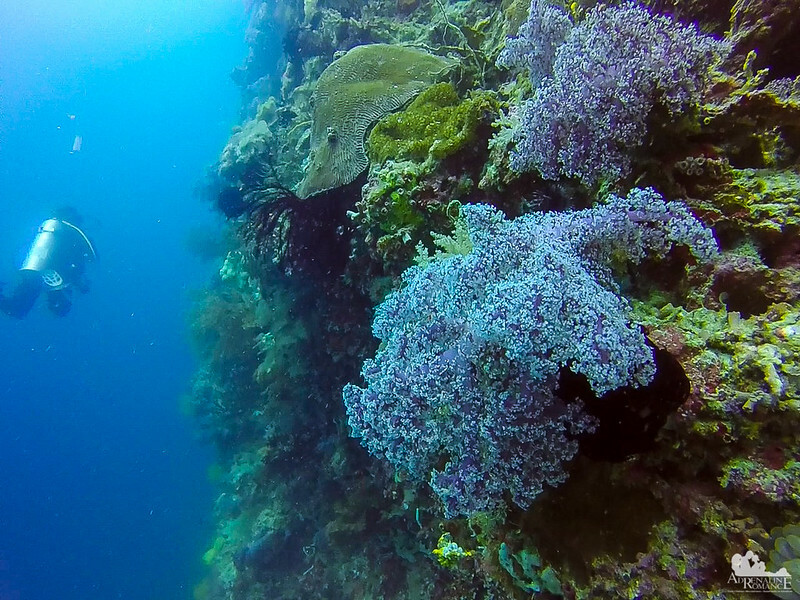 Fan-like hard corals also shared the cliff with their softer counterparts. Hard corals are marine animals that produce hard skeletons made of calcium carbonate to protect their sensitive and delicate organs. Note though that their namesake does not mean that they are tough or indestructible. Just like all corals, they are quite fragile, and a single brush can break off those branches, which takes years to regenerate. 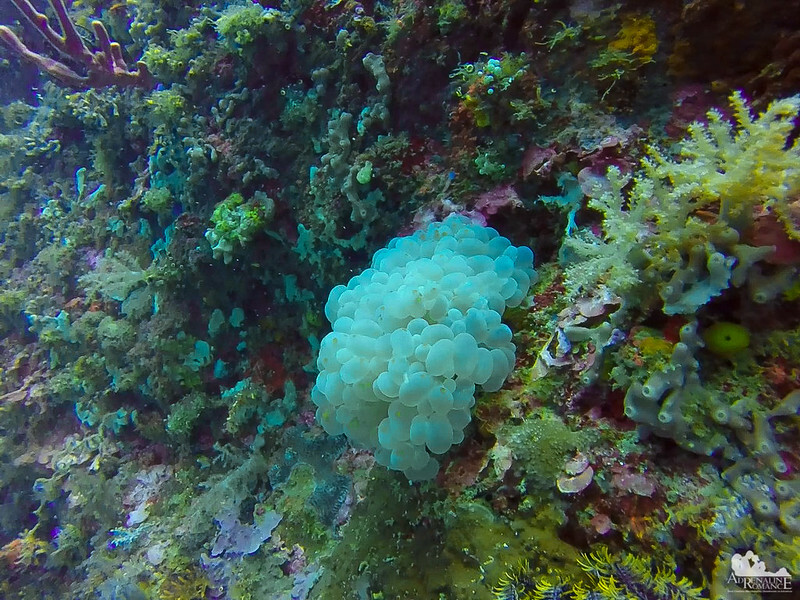 Quite common and exquisitely cute, these bubble corals are found in many areas of Arco Point’s wall. The bubbles conceal tentacles that the coral uses to capture food. Although they are plentiful, due to climate change and reef destruction, bubble corals are now considered a “near threatened” species by the International Union for Conservation of Nature. 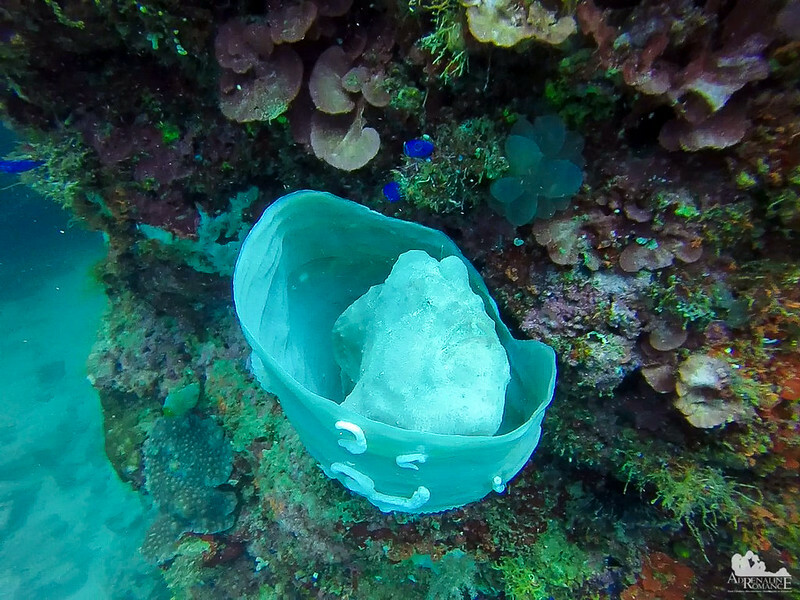 Hexactinellid sponges like these make great homes and resting areas for fish, turtles, shrimps, and other marine animals. More soft corals of the Nephtheidae species adorn the wall. They are really pretty, and they sway with the slightest current, giving the impression that they are dancing to the tune of Mother Nature. Dark green Acropora corals are part of a group of reef-building stony corals. They provide fish with shelter and protection from predators. 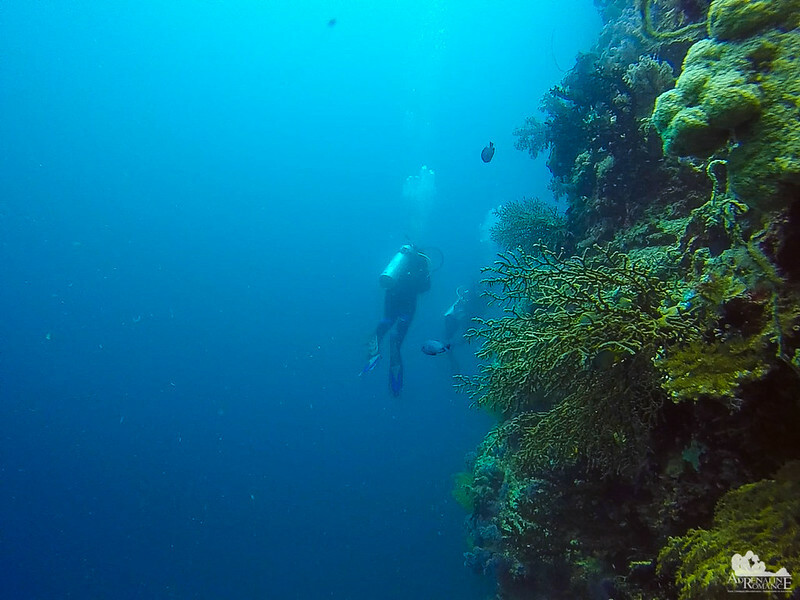 Check out that group of fish behind our divemaster. Being in a perfect line, it seemed that they are following a natural but invisible highway that leads to the deeper parts of the reef. Bushes under the sea? No, they are soft corals with mature polyps. Also, check out the small sponges and the crinoids that share this part of the cliff with the coral. 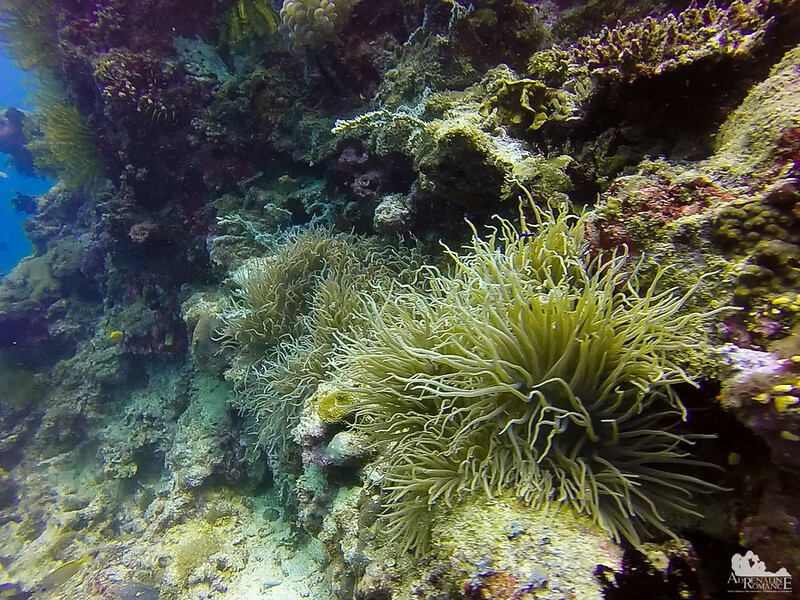 Predatory sea anemones quietly lie in wait for any unsuspecting fish and crustaceans. Those tentacles are deadly; the slightest brush can trigger a neurotoxin that can paralyze prey. Tentacles then draw the helpless prey into the mouth, which is located at the center of the anemone. In general, the toxins of most species of sea anemones are harmless to humans. But there are some rare ones that are highly toxic and lethal. 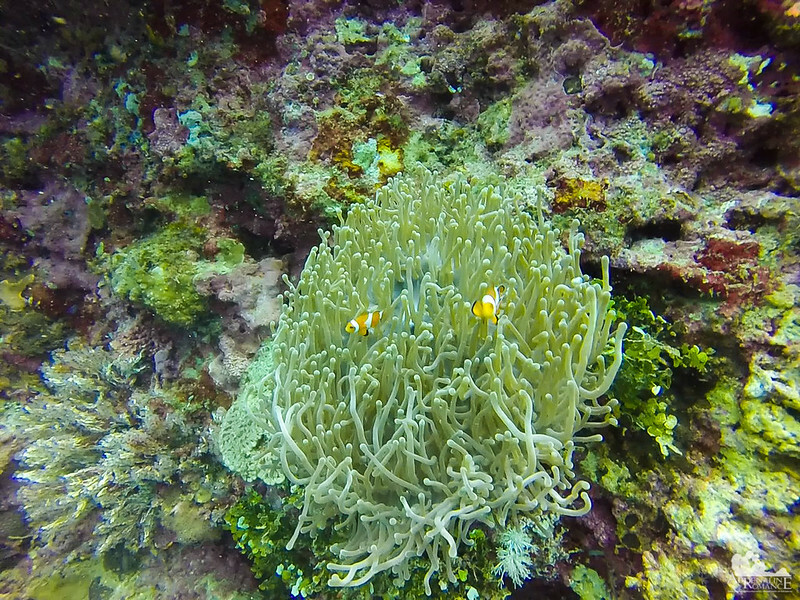 Where there are anemones, there are also clownfish, which are immune to the former’s stings! This is a classic example of mutualistic symbiosis. Through its stinging tentacles, the anemone protects the clownfish from its predators. In return, the clownfish’s feces provides food to the anemone. In addition, clownfish are sworn enemies of butterfly fish, which actually eat anemones. Small yellow assessors busily milled about, inspecting and cleaning their coral home. With our air getting low, it was time to slowly head to shallower water. 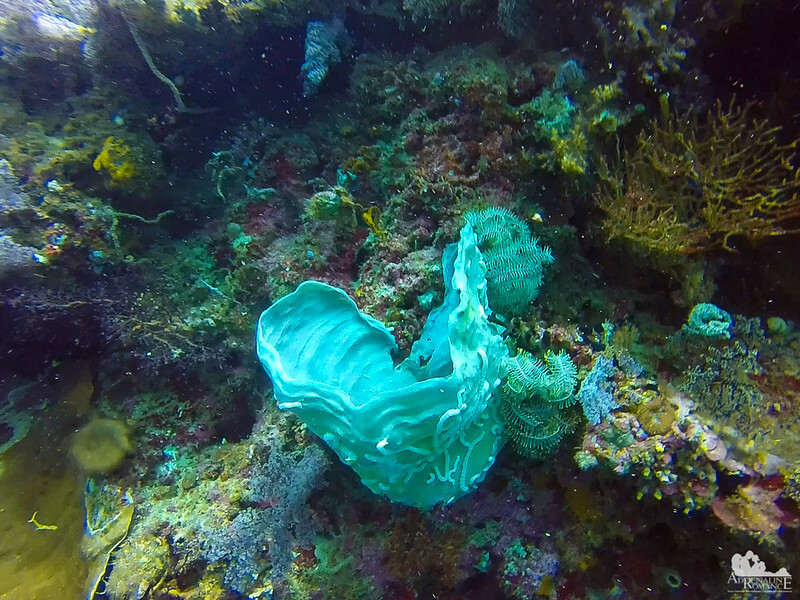 As we gradually ascended, we came across this paper-thin coral that juts out across one of the wall’s outcroppings. Initially, we thought it was a discarded paper bag! 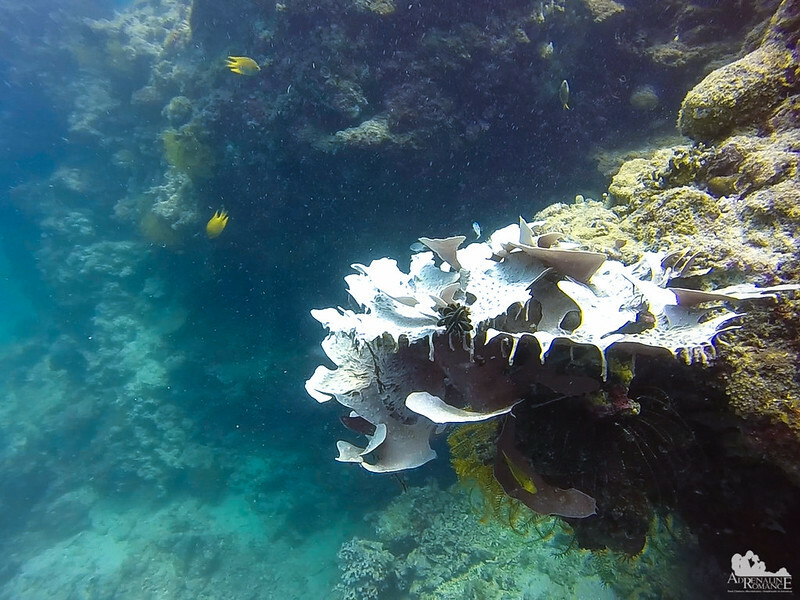 We also spotted this large crown-of-thorns starfish feeding on a coral. Too bad we didn’t have a net bag where we can put the starfish in. 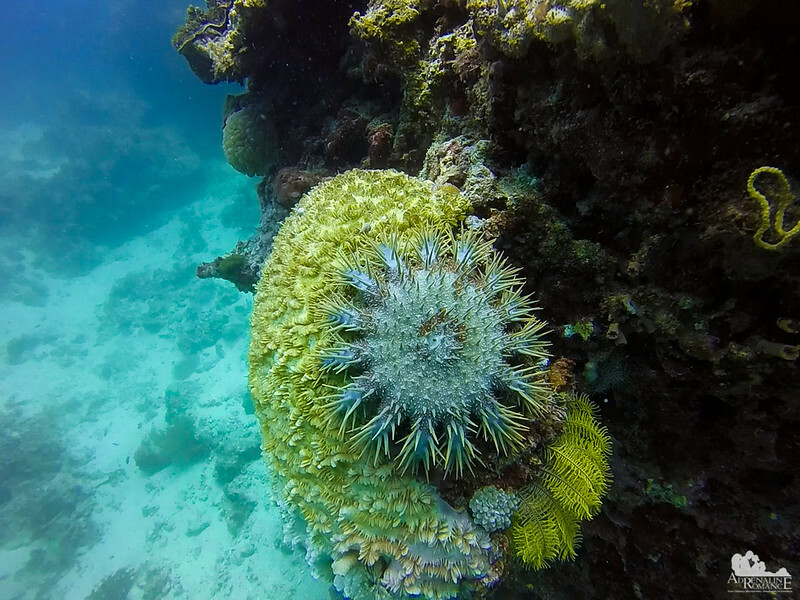 Crown-of-thorns starfish have become a pest because the Triton trumpet shells, which are supposed to be the starfish’s natural predators (and thus maintaining a healthy balance), are scarce. The tritons have been harvested by humans to be used for shellcraft. Without the tritons to eat them, the crown-of-thorns multiply and spread with wild abandon. This definitely shows that if we tamper with Mother Nature to appease our own greed, if we do something to disrupt the balance of Nature, something undesirable will always happen. A group of spiky crinoids hangs out with a hard coral. Crinoids eat microscopic plankton that are trapped in their spiny tentacles, which are covered with sticky mucus to aid in their feeding. Crinoids are food for some species of sea urchins. A large blue starfish hides behind the cluster. Finally, still having 80 bars of air as indicated in our SPGs, we exited the cliff and landed on a sandy shelf just 10 feet below the water’s surface. While having a safety stop for a few minutes, we asked JI to take a photo of us. Obviously, we had a totally fun dive, with smile bubbles rising up to the surface. Check out this short video here. The entry to Arco Point’s wall is quite cool! 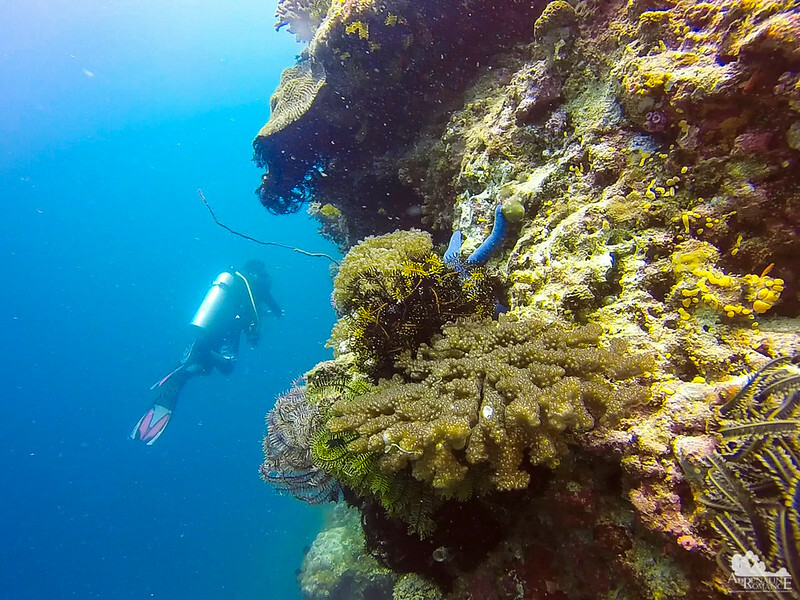 Arco Point is just one of the many dive sites along Panglao’s shoreline, but it gave us a glimpse of what diving in Bohol is all about. 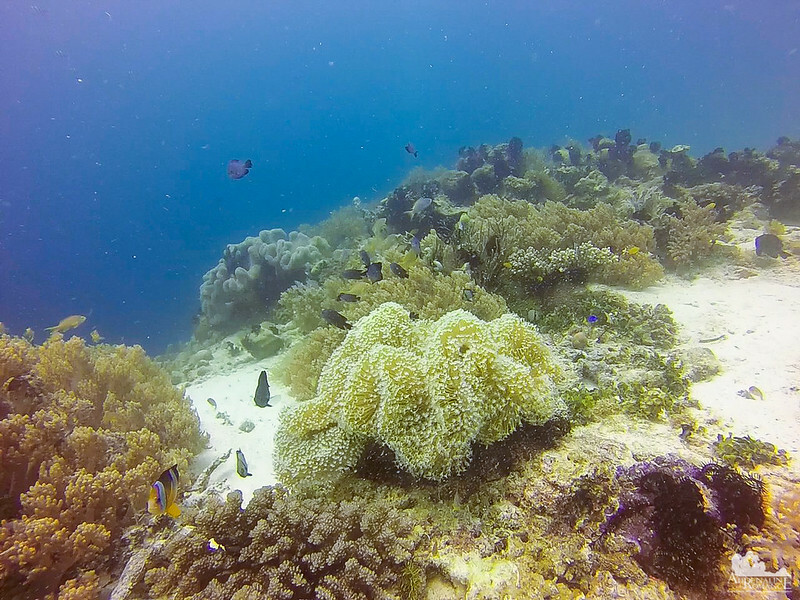 As you can see in the photos above, the reefs around Panglao island are simply spectacular! The biodiversity is beyond amazing. It is not difficult to see why Panglao silently beckons scuba divers, snorkelers, and marine biologists to come. 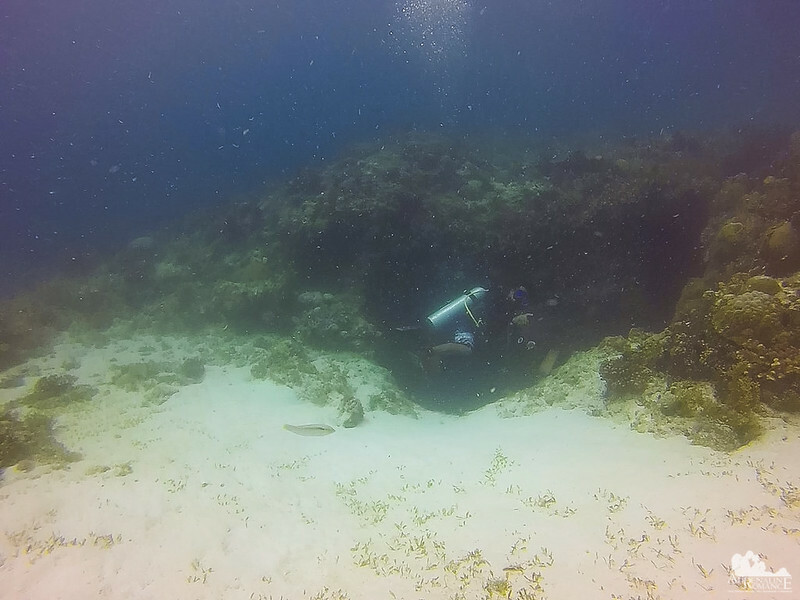 Try scuba diving in Panglao today! 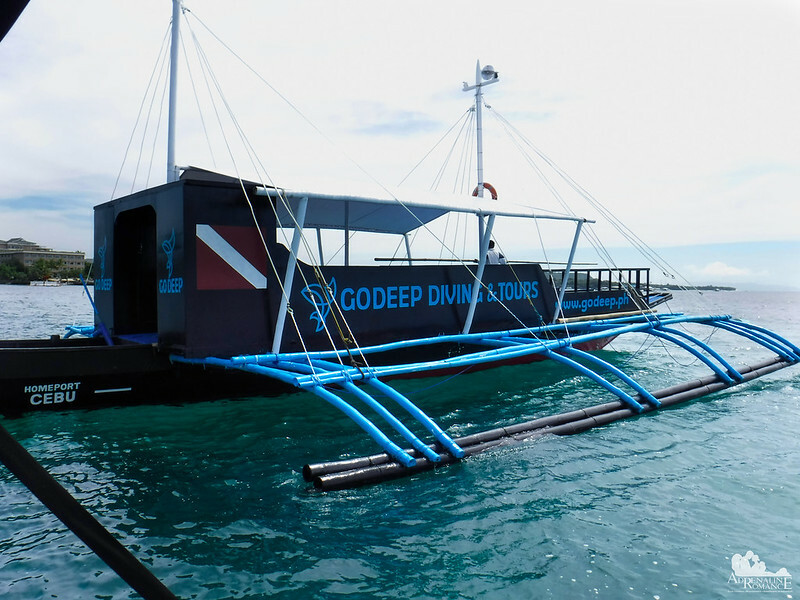 For booking your dive or if you want more information about the scuba diving in Panglao, get in touch with GoDeep Philippines using the following contact details. 1. For optimum visibility, it is best to dive in the morning when the sun is shining and at the right angle. In addition, there are fewer divers in the morning, so heavy siltation is not likely to obscure visibility. 2. 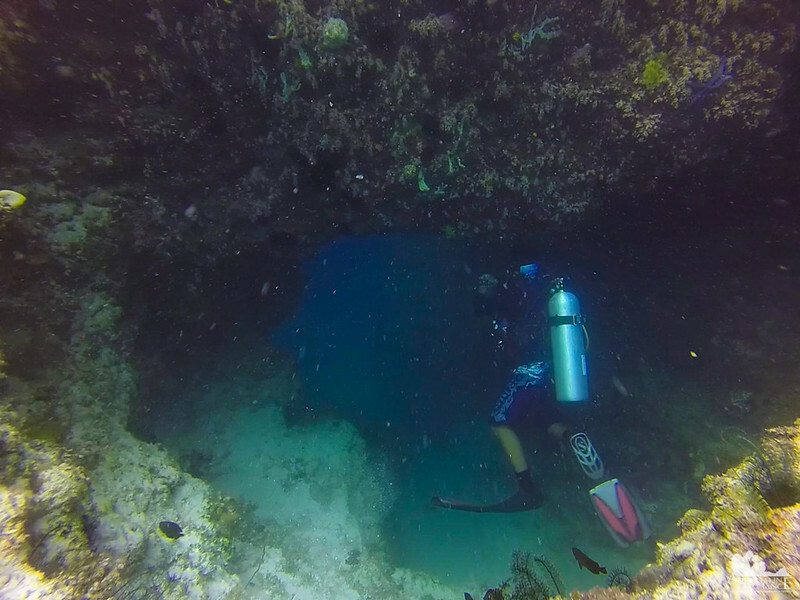 Several dive sites in Panglao have different conditions and characters. That means, some dive sites require a higher level of scuba diving experience and skill. Be sure to tell your Divemaster your skill level. 3. Establish neutral buoyancy as soon as you can to avoid touching the seabed. 5. Be a safe and responsible diver. Always observe the Leave No Trace principle. Never touch, disturb, tease, or collect marine wildlife. Remember we are in a protected area and an alien world that demands respect. The underwater world offers such a different experience. This is the first time I have heard of all these names like clownfish, crinoids, assessors. Interesting post. Indeed! Sheila and I realized that two-thirds of the Earth is made of water. And we live in a tropical country surrounded by water. Sounds like you had a super adventure under the sea! This is one of the activities we are missing but we have to try it for sure. We envy you. The world under the sea is amazing, beautiful photos!! I think I should go for a scuba diving course. The world under the sea is so beautiful! I will keep this place in mind, thank you for sharing. We would suggest you undergo a DSD (Discover Scuba Diving) session first. This is a limited-depth dive with no certification. 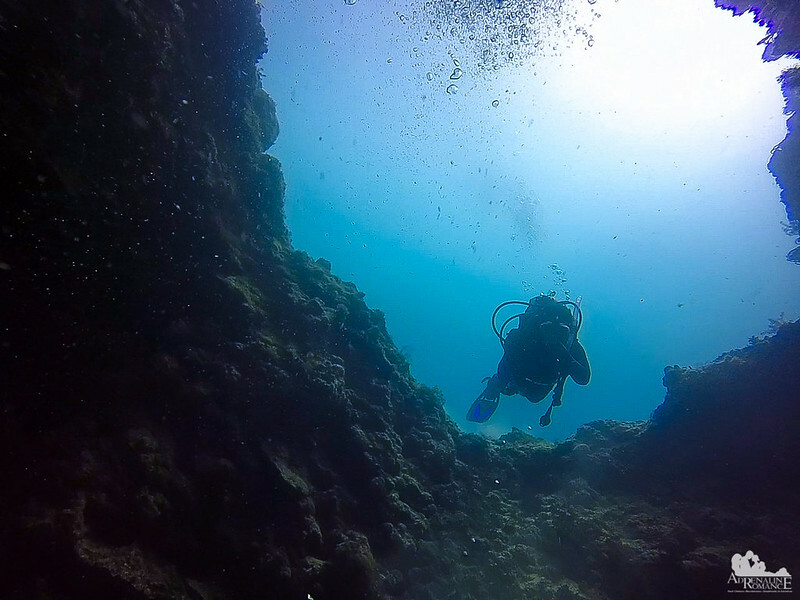 DSD allows you to experience diving first-hand so that you can decide for yourself if diving is really for you. If you decide that scuba diving is perfect for you, then you can go for certification. 🙂 We recommend this approach so that you won’t have to waste money; scuba diving certification is somewhat expensive. Thank you very much. The Philippines has some of the richest coral reefs in the world, considering that it is a part of the Coral Triangle. Please do visit the Philippines when you have the chance. What an incredible world you guys entered through that hole! 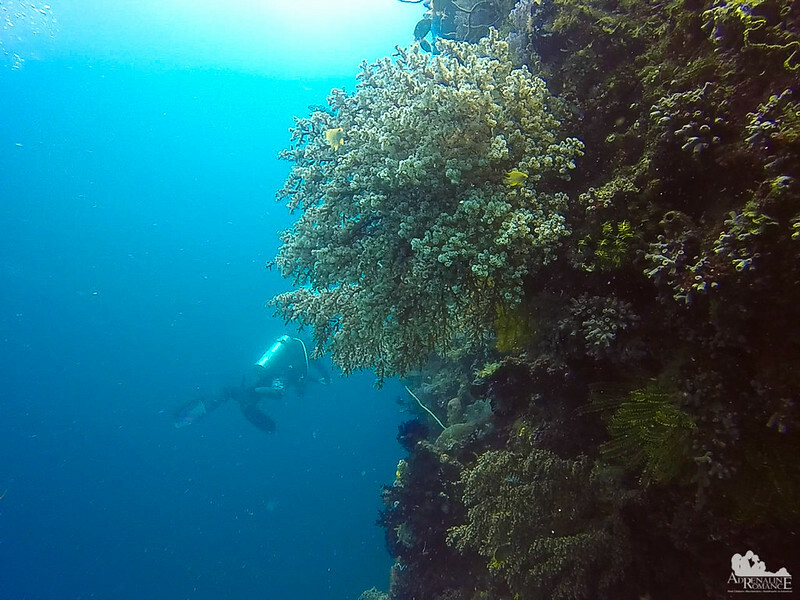 It must me difficult to be careful not to accidentally kick or hit the fragile reefs there! I have never gone scuba diving but I imagine this would be the place to start for a great experience! That frog fish has amazing camo abilities! Please do so. Panglao is somewhat like a “diving megapolis” of the country. Heheh! 🙂 You will love it there. The Arco Point looks unreal and exciting. I’d feel like treasure hunting under the sea if I were in your situation. The frogfish looks fascinating and really good in camouflage. I did not notice it immediately on your photo. I’d like to experience this too someday but I need to learn scuba diving first. What a wonderful post! I thoroughly enjoyed reading it. We have been thinking of visiting Philippines for long and hopefully that day comes soon. 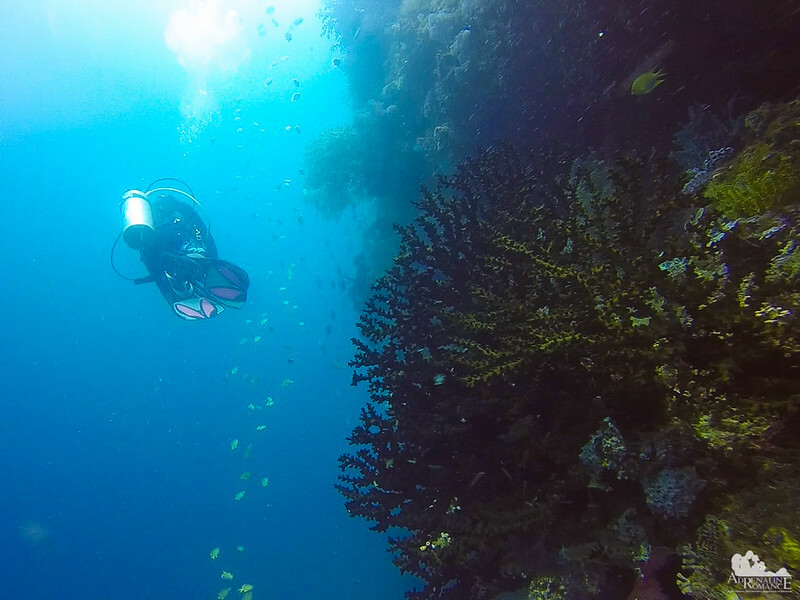 The scuba diving is one of highlights as Philippines has so many beautiful islands. Loved watching the video and loved all the pics. 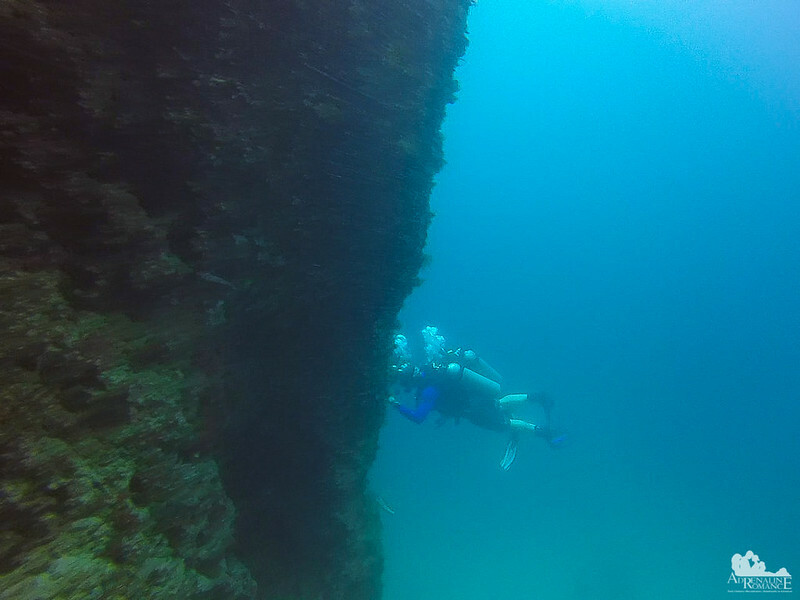 There’s no need to be scared; you can breathe underwater and there’s a divemaster who ensures your safety. 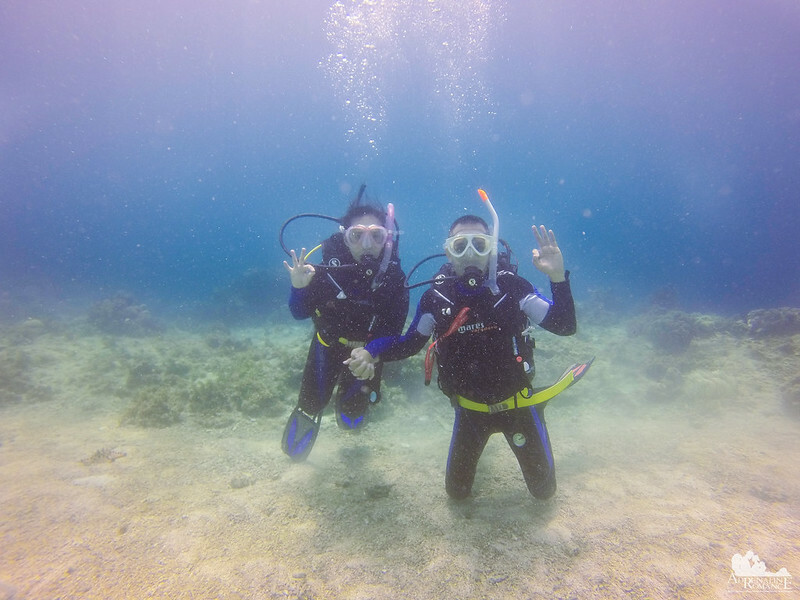 In fact, we have a friend who was able to conquer her aquaphobia when she scuba-dived with us! 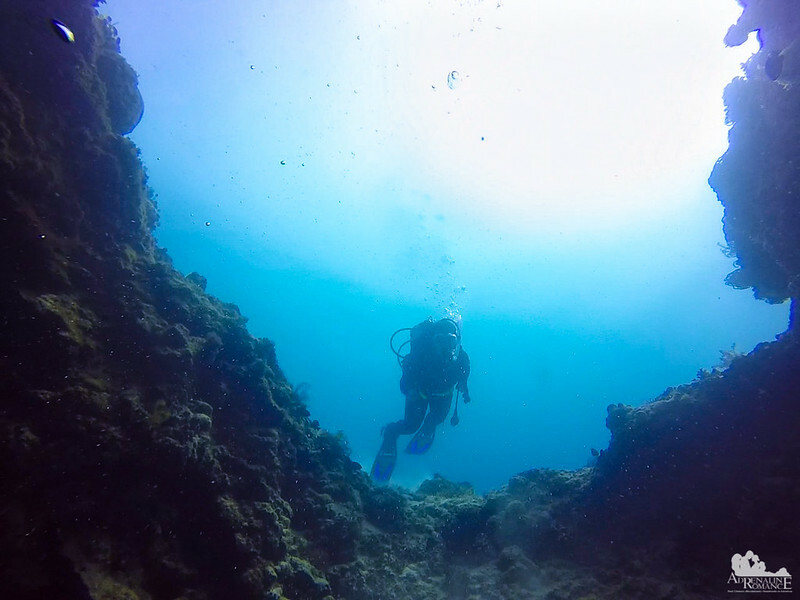 Try scuba diving in the Philippines; it’s awesome! The pictures you provided are simply stunning. I’d love to go scuba diving there! Believe it or not, Sheila doesn’t know how to swim! But she scuba dives even though her technique is a bit awkward due to the lack of swimming skills (her movements in the water is not natural or efficient). Thus, you can definitely dive even if you only have rudimentary swimming skills. We strongly suggest you first enroll in a DSD (discover scuba diving) session; all dive outfitters provide it. A DSD is designed to provide you with an actual scuba diving experience without worrying yourself about technicalities and equipment. After a DSD session, if you feel that scuba diving is for you, then you can proceed to full open water certification.